As the boxing world has just taken in Anthony Joshua’s twelve-round Unanimous decision victory over Joseph parker in Cardiff, Wales, the sport patiently awaits news on what the future holds for Boxing’s glamour division. Joshua is now 21-0 with 20 knockouts and also the owner of the IBF/WBA/WBO titles, so all eyes are on him. People are especially interested if we will see the champion from Britain showdown with WBC champion Deontay Wilder next. As we all know, Wilder too has a lot of momentum going, having just stopped Cuba’s Luis Ortiz on March 3 in a barnburner. But the reality remains that we may not yet see these two champions face-off, at least not in 2018. Wilder had been extremely vocal about the clash, yet Joshua and his team seem far less interested. That leaves Wilder with having to look for new opponent and there may be one right in front of him. And one that could also generate some headlines and rekindle some bad blood. Wilder (40-0, 39 KOs) and Domonic Breazeale (19-1, 17 KOs) had previously got into a heated altercation inside of the lobby of a Birmingham hotel after Wilder’s fifth-round stoppage of Gerald Washington, which happened in February 2017. The start of their feud began inside the nearby Legacy Arena, as Wilder’s younger brother, Marsellos, and Breazeale exchanged words and nearly blows after Wilder’s win against Washington. Wilder hasn’t forgotten that either. Anyone who knows Wilder knows he is a man who operates off of emotion and this could be the perfect time for a brawl with Breazeale. “That is something that we’re gonna be putting on the table, along with a lot of other things” said Wilder. 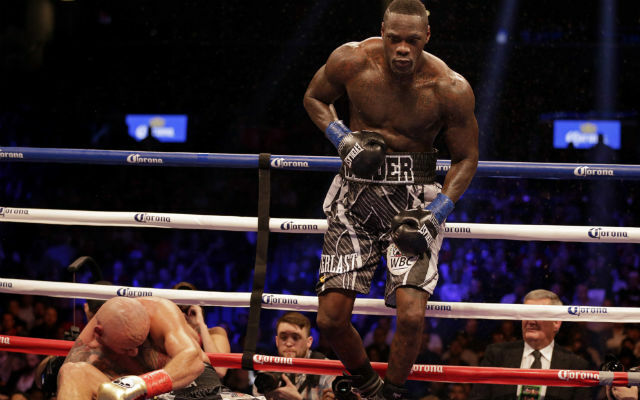 The Tuscaloosa, Alabama, native made a mandatory defense by knocking out Bermane Stiverne in the first round of their rematch November 4 at Barclays Center in Brooklyn, so he is now allowed a voluntary defense. Breazeale stands 6-feet-7, 255-pounds and is ranked No. 2 by the WBC and has lost only to Joshua, who stopped Breazeale seven rounds in their June 2016 bout in London. England’s Dillian Whyte (23-1, 17 KOs) is the WBC’s No. 1 heavyweight contender and he too has been asking Wilder for the fight. Wilder, however has only expressed interest in facing off with Whyte if it were to come with a guarantee of a Joshua fight afterwards. Let’s wait and see how this all plays out.